Somebody wrote Muhammad Ali as America’s first and last Muslim icon but one sincerely hope if a society which always claim to give opportunities to all, terming Ali as the last Muslim icon itself is the biggest failure. Muhammad Ali is no more but his death has revived him more than ever and his popularity transcended nations and nationalities. One thing is certain that there is no one like him and its not a hyperbole coated in some adjectives as we are so much habitual of when putting our ‘sports’ and film stars over the top just next to ‘God’. Why is Muhammad Ali different and a super star of the common people world over while any one else does not come near to him or remain pale in front of his convictions and courage to say things. Sports are not apolitical things as many would make us believe. In fact, most of the time, our ‘non-political’ icons are highly ‘political’ and take decision according to their ‘convenience’ and adjust according to power elite. How many of our icons whether ‘cricket’ or Bollywood in India, have taken a stand which shook our dilapidated structure? In fact, most of them will side with those who justify injustice and discrimination just for a few favors. We have seen all the ‘icons’ changing their colors and making ‘politically correct’ statements when our own ‘Donald Trump’ took over belittling every other democratic institution and terming every dissent as ‘anti-national’. The tragedy is that world’s largest ‘democracy’ did not find strong enough voices on these issues but Ali, at this fag end of his life, gave not only Trumpet but also the Muslims a lesson about Islam. The statement that he made clearly suggest that Ali could have been the best Ambassador of Islam and he clearly mentioned that despite being a Muslim he consider true Muslims can not support or encourage any kind of violence that kills innocent people. He responded to Trumpet’s anti-Muslim rhetoric, ‘I am a Muslim and there is nothing Islamic about killing innocent people in Paris, San Bernardino, or anywhere else in the world. True Muslims know that the ruthless violence of so-called Islamic jihadists goes against the very tenets of our religion. The power of Muhammad Ali was that he took pride in his black identity first and all other identities came later. Probably, he was humiliated for being so but then he never compromised that. He used his iconic star status to raise the issue of racism at all the global platform which ever were available including the post-match press conferences that he addressed. One may feel it crazy when he referred he was the ‘greatest’ but that was the confidence and the hurt that he had to speak up provokingly every time he felt that his ‘ability’ was being questioned and when he won laurels for his sport, he knew it well, that it was not his black identity but the trophy that he won, matter for those who are appreciating him. He rejected every attempt to ‘coopt’ him and ‘mainstream’, instead, he became the mainstream. Here lies the lesson for all of us, for those politicians in India who use their identity as a card to be part of the ruling structure. They do it as bargain for their position and frankly speaking lecture community about ‘hard work’ and ‘change’. Why, I am saying is because people who claim to represent the marginalized when come to power and near it, actually, get coopted most of the time. Community for them become a leverage to extract their pound in flesh otherwise we have seen whenever a person goes to get his work done, most of the time, we get to hear ‘lectures’ from these ‘leaders’ whether we have voted to them or not during the last elections. Most of the politicians and so called non-political icons did not have the courage to speak up and stand against such people who are threat to the very idea of India. What I am seeing that it is difficult to be like Muhammad Ali who despite rising to the highest level of popularity still remained committed to his cause and did not compromise. He did not change simply because he needed to be after winning the championship. He was not into politics yet more committed to eliminate racism than the politicians. Hence, when, I see politicians, bureaucrats, icons and superstars compromise and then give us ‘knowledge’ this is the need of hour or they were forced to do so, I am reminded of Ali who would have earned billions and trillions just to reject his own people and suggest that ‘America’ is the land of ‘opportunities’. He never believed so and persistently questioned racism. The question is why is United States moaning so much for Muhammad Ali ? Is it hiding some thing or marketing him as in the world of market whether people dont accept your ideas or idealism but just watch you or listen to you due to your ‘achievements’ which become a justifying point for capitalist economy as their ‘success story’. So, Muhammad Ali became America’s ‘success story’ of ‘multi-culturalism’ and equal opportunity for all despite his own rejection of the whole capitalist format but then the market forces are not bothered about your ‘ideology’, for them Muhammad Ali became like Che Guevara who despite hatred remain one of the most marketable icons in the West. What lessons are there for us in India with Ali’s personality who once travelled and what has his message to Islam. I think, these issues need to be seriously pondered over. It is important for us to understand that for him his black identity was perhaps the biggest and the sense of social injustice had always hurt him as he was vociferous in condemning violence and killing of innocent people in the name of Islam. He could never have sided with Islamic fanatics and had time and again spoken against them. One has to see him in totality. Why did he convert from Christianity to Islam? And definitely it was not a single day event. It took years of his association with Elijah Muhammad and Malcolm X whose movement had actually shaken the United States. The problem with Christianity was that despite missionary work of many with the community of blacks, it had no answer to the whole question of slavery and segregation. It did not bring any radical change and as Muhammad Ali says, ‘ he felt emptied despite a good Christian upbringing which could not give him another name and continued with the title of slave name. His original name was Cassius X Clay with title Clay meant to be taken from their masters. It means Christianity could not radicalize him in condemning and taking on the symbols of slavery. Perhaps that and a few other things compelled him to go for a radical political Islam though frankly speaking he was speaking for social justice and not a rebel rouser in the name of Islam. You need courage of conviction to stand up against the power. You need ideas to defend yourselves in the height of emotion and ‘nationalism’ amidst the war cries and Ali had both of them when he rejected to join the armed forces and serve in Vietnam on April 28th, 1967 with a penalty of five years in prison and USD 10,000. And the punishment was more from the ‘nationalists’ than the court. He lost his world heavyweight title and all his licenses were suspended. 10 years he did not fight. That is a big loss for anyone in professional life. The issue of segregation kept America on turmoil. There was a kind of self-respect movement for people like Malcolm X who were trying to respond to whole question of slavery through radical Islam and challenging the whole issue of capitalism and dominance. There was other side of people who were softer and believed more in reconciliation like Martin Luther King and perhaps did not feel that religion they follow is responsible for the whole crisis. The point is the Black movement in the United States was torn in between these two streams political Islam and evangelical Christian groups, but at the end, it was the Christian theology that ultimately won their way. Islamic radicalism among black was receding. Muhammad Ali himself seemed to be fed with that and ultimately embraced Sufiism, which for many radical Islamists is not really Islam. Faith is an internal matter. For some it is an act of revolt and Muhammad Ali chose that. He remained a messenger of peace and social justice all his life. He paid a price of embracing Islam in the world of Christendom and was leveled as traitor and terrorist but he never tried to defend what he wasn’t. He always felt proud of his identity and his ideological conviction. He knew that his sports achievements had made him an icon of the entire oppressed and marginalized world over and he never let them down. He was no novice and understood the whole global politics hence his cry against attack on Vietnam was not apolitical. He supported the cause of Palestine and went to meet Fidel Castro when Americans felt both Castro and Yasser Arafat as terrorists. There is a lesson for the icons, particularly those who want to be called as having faith in social justice or social issues. The message is that you will have to take political position and cannot be goody-goody to power elite all the time. For us in India when the whole debate on nationalism and patriotism is making us busy, Muhammad Ali remain the ultimate ‘anti-national’ and yet Americans could not disown him for the magnitude of his success and perhaps with their growing maturity of accepting dissent part of their culture. We have ‘Gods’, Shahanshahs and ‘Mahanayaks’ with mercenaries at the TV studios singing hosannas to them yet most of them remained highly opportunistic in their personal lives and extracted favor from the power. A small gesture of good will of these icons can make a lot of difference as we know the grave fact that ‘when Muhammad Ali speaks the world listen’ and in all seriousness. The icons can not be upholding the capitalist orientations and just inaugurating a few ‘charity shops’ for their photo-ops. 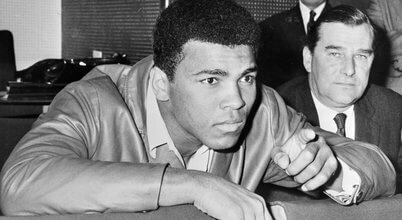 Muhammad Ali’s conversion to Islam was condemned by not just Christian right wing nationalists but also America’s secular and other ‘progressive’ people as most of them have one commonality in considering Islam as religion of beast. But the fact is when an icon embrace a faith of his choice, it does not matter much for him as most of the time these ‘conversions’ are more political in nature than really anything else. What mattered for him was his ‘rejection’ of the old faith and that ‘jolt’ those who discuss everything under the sun accept their own faith. When Baba Saheb Ambedkar embraced Buddhism in India, it was not that the Hindus were worried much about that but they were worried with the fierceness of him in rejecting Hinduism. Both Hinduism and Christianity claim to be epitome of ‘tolerance’ and ‘equality’ but Muhammad Ali’s conversion and that of Dr Ambedkar’s to Buddhism in India expose those myths woven around the oppressed people about ‘liberation theology’. World over, the victims of racial segregation were compelled into Christianity through mocking at their original faith. This was the work of the evangelical theologians and in India the same was done by the brahmanical forces so any ideological and political challenge to the dominant culture and faith have never been taken lightly by those who claim to be ‘secular’ ‘liberal’ and democratic both in India and the United States. We need to understand that there was an inherent political message in conversion whether it was Ambedkar or Muhammad Ali and both of them were known for their liberal social outlook hence even in the new faith they won’t accept anything which goes against their radicalism. In fact, Dr Ambedkar went a step forward and redefined Buddhism for his supporters and followers which he termed as ‘Navayana’ or ‘New Way’ so that they are not confused and his 22 vows were categorical as what kind of path should the people follow. For me, it was nothing but purely humanism. Unfortunately as in India where left, liberals, democratic, socialists rarely raised the issue of caste discrimination (they might be raising it now when the Dalits, OBCs and others are organizing themselves), in the USA the same happened and race relation came into highlight when the community rose against it whether it was Martin Luther King, Malcolm X, Rosa Park or Muhammad Ali. In India, the caste discrimination has now entered into political discourse only when Dr Ambedkar fought for and later with the emergence of Bahujan Samaj Party founded by late Kansi Ram and initiation of implementation of Mandal Commission report for the Other Backward Classes. It is well known to most of us how Dr Baba Saheb Ambedkar was condemned and accused of being loyal to British just because of his difference with Gandhi and refusing to accept him as the only leader of Dalits. The experience from both USA and India reflect that the oppressed, subjugated and the marginalised have to develop their own leadership and question the historic wrongs but merely questioning will not resolve the crisis. You have to have courage to call a spade a spade even if you have to speak up even against those who use community name and do all the wrongs. Muhammad Ali had that courage. The historical questions of caste and racial discrimination are more on fiction and perception built by the power elite to deny communities rights and leadership as well as confident to develop that because they ‘teach you to hate yourself’ as Malcolm X said so powerfully. But it is also true that mere hatred and negativity will not bring anything. That is why Ambedkar become important for all the people of the world to understand as he called of Equity but with fraternity. Those who put aside the issue of participation of either blacks or Dalits as merely ‘identity’ politics are today compelled to speak up of their world vision, those who felt that whether Ambedkar or Ali, became ‘religious’ and found answer in ‘religion’ and not in ‘secularism’ will have to ponder over as why secularism or all these elitism become status quo ante and never really tried the whole question of discrimination based on segregation or caste. In both Ambedkar’s and Ali’s embracing a faith never meant they adopt the orthodox and traditional way of religion. For them, more important was the rejection of the faiths which subjugated them and kept them oppressed for centuries, may be tied them into mental slavery. You have to unchain yourself and that is only possible, through rejections of the old beliefs and embrace, those ways, which gives you freedom and choice. Not everyone subscribe to those beliefs yet many would have agreed with the issue and not with the solution offered by Malcolm X and followed by Muhammad Ali and many others. America moans for Muhammad Ali. Ultimately they accepted his identity as a Muslim, which for years he was denied. In these times of crisis when being a Muslim in America is a challenge as right wingers are beating their Trumpet and future look very uncertain for migrants and others, Muhammad Ali and his courageous life message will come to protect them. Somebody wrote Muhammad Ali as America’s first and last Muslim icon but one sincerely hope if a society which always claim to give opportunities to all, terming Ali as the last Muslim icon itself is the biggest failure. Will America never have anyone like Muhammad Ali? Fortunately, in India, we feel that an enlightened Ambedkarite age has just begun and political movement has taken shape so the victim of hidden apartheid are now standing up and questioning but as capitalist moneybags now influence polity here too, there is a danger of ours going the American way. The failure in United States was that the civil rights movement could not become a strong political movement and the radical spirit of it was purely coopted in the whole capitalist electoral system of America where contesting elections itself is too expensive and impossible for people beyond two political parties. Where is the option for political power of the blacks and other racial minorities in America in this heavily expansive electoral system there? The electoral system have undone many things which Muhammad Ali and other radicals of the black movement achieved so powerfully by converting America into almost bipolarity and the danger is that the same kind of capitalists are trying to influence Indian polity in the same way between two brahmanical capitalist political parties. Fortunately, Ambedkar’s socio-political legacy in India is much more powerful than Ali’s in America and hence chances of resistance in India are much bigger than in the United States where Malcolm X whole power movement has relegated into history and Christian rightwing has won over the Black identity issue. Racial prejudices deep-rooted in Indian heart?